It's transferred from original elements by the Czech National Film Archive. 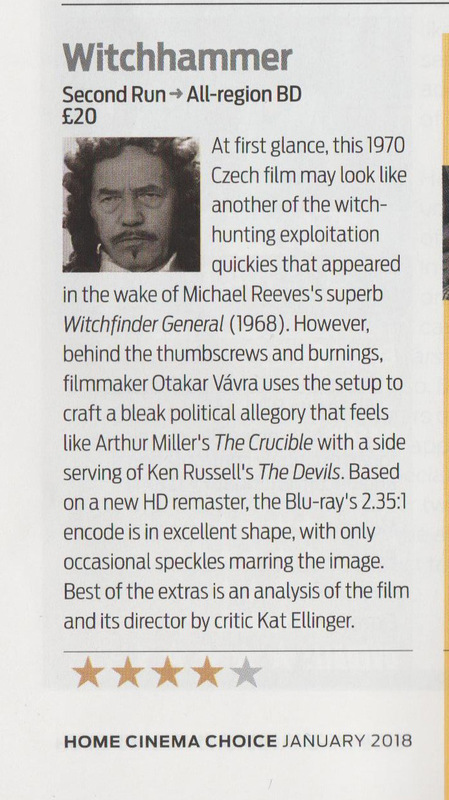 "Remarkably relevant and as upsetting as ever, the 1969 Czech drama WITCHHAMMER is horror of a philosophical and political sort.... Second Run's release is filled with strikingly unsettling black and white images - and does full justice to Otakar Vávra's film." "A supremely chilling character piece and a parable on the corruption of power. Brilliantly acted, wonderfully shot, wistfully scored... I was bowled over by Second Run’s latest." "Remastered in HD and presented here on Blu-ray for the first time, WITCHHAMMER's crisp, and frequently disturbing, images gleam"
Great film. Part of Krumbachova's contribution is to show the connection between totalitarian zeal and toxic masculinity. In many ways, it's the failure of the local male population, which is happy to marry their daughters off to older men, to do anything to put a stop to the increasingly lecherous inquisitor and his no-less-lecherous assistant that causes events to spin out of control. And why would they speak out? They've got their own positions, reputations, and yes, privilege to protect. One might well read this film as a representation of how privilege breeds complicity. I'd love to see more of Vavra from Second Run. "A bleak political allegory that feels like Arthur Miller's The Crucible with a side of Ken Russell's The Devils. Based on a new HD transfer, the Blu-ray's 2.35:1 encode is in excellent shape"
Bought this on the basis of year-end poll recommendations. I thought it was an amazing film and a very satisfying transfer. I also thought both the Deighan's print essay & the Ellinger/Brooke video essay were excellent. I wish all special features were as thoughtful and informative as these.